Testing ground and surface water is not a do-it-yourself project. The legal admissibility of test results depends on following a strict protocol. Shown is Nathan Askins, Environmental Analyst for Downstream Strategies. Among the saddest regrets for property owners who believe their water is contaminated by gas drilling: They didn’t test their water before drilling began. Whether property owners embrace drilling or not, anyone who expects drilling in their community should have their water professionally tested using a certified analytical laboratory. For most citizens, their property is the single most valuable asset they possess. No surprise – contaminated water impacts property value, use and the ability to sell that property. Testing your ground and surface water is not a do-it-yourself project. The legal admissibility of your test results depends on a strict protocol. Evan Hansen, President, and Nathan Askins, Environmental Analyst, shared their guidance on what landowners should expect when considering professional monitoring and testing of water on their property. The following is based on Downstream Strategies’ current practice and protocol. 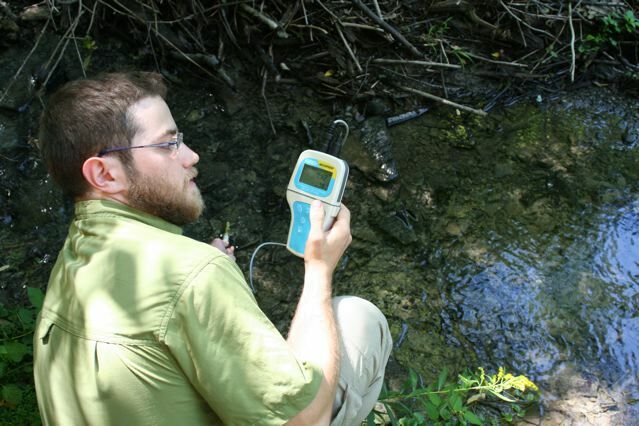 The water monitoring and testing service begins with defining the scope of the work with the property owner. Does the property owner want only well water tested, or does he/she want all surface water (ponds and streams) as well as ground water (well water) tested? Next, what do you want to test for? As more is learned about chemicals used in drilling for shale gas, the potential test list grows longer. Property owners should always look for the latest, updated water test recommendations if shale gas drilling is moving into the neighborhood. Current recommendations include testing for pH, conductivity, total dissolved solids and arsenic to methane and BTEX chemicals (benzene, toluene, ethylbenzene and xylene) to radiation (gross alpha, gross beta and more). A detailed list follows in this post. Certified labs require multiple containers for each area sampled (water well, ponds, stream, etc.). The lab provides the sampling containers. Some labs require five containers; some require as many as 18. In other words, if a property owner is testing two water wells, two ponds and a stream, that would equal five sample areas. To that would be added a “field blank” sample, which is a quality assurance/quality control measure. The required field blank containers would be filled with distilled, dionized water labeled and submitted to the lab along with the “real” samples. For a project based on five sample areas plus the field blank – and using a lab that requires 18 containers per sample area – that amounts to 108 containers. If the lab only requires five containers per sample area, that would be 30 containers. Certain sample containers require zero headspace between the fill of water to be tested and the inside lid of the container. In other words, no air space between the top of the water sample and the lid. This protocol applies to lab testing for methane and the BTEX chemicals. Downstream Strategies takes GPS (Global Positioning System) coordinates for each sampling area so the location of the sampling can be pinpointed. pH, acidity, alkalinity, hardness, conductivity, total dissolved solids, iron, aluminum, manganese, calcium, sodium, sulfate, chloride, arsenic, barium, strontium, lead, bromide. BTEX (benzene, toluene, ethylbenzene, and xylene); total petroleum hydrocarbons (TPH) in the gas, oil and diesel ranges; acrylonitrile; and methane. Depending on the size of the property and the areas to be sampled, the time spent on your property could range from 4 to 8 hours. Cost will be driven by the scope of the work. For example, one recent professional monitoring and testing involved a property with more than 50 acres. The areas to be sampled included two ponds, two wells and a stream, and included a field blank. A significant amount of travel was required which added to the expense. Cost to the property owner in this case was about $7,000. About half of that total cost was for the certified lab tests. If the water monitoring service is sampling a property that is relatively local (reducing travel and labor costs); and only one water well plus field blank is to be tested, the approximate cost would be about $3,200. If the property owner decides to eliminate the quality control/quality assurance of the field blank, and wanted only one water well tested, the cost would be about $2,500. There are alternatives for landowners who find the cost of professional water monitoring and testing too high. Headquartered in the heart of the Barnett Shale near Fort Worth, Texas, ShaleTest is up and running in three states – Texas, Pennsylvania and Arkansas, according to Ruggiero. The organization is seeking to expand and is looking for volunteers, especially in Marcellus Shale states. ShaleTest will use nationally certified laboratories with chain of custody certification. Among its advisors is Wilma Subra, a recipient of the MacArthur Foundation’s Fellowship “Genius Award” for helping citizens cope with and fight environmental issues in their communities. 2 In states like New York with the equivalent of eminent domain in the form of compulsory integration, property owners are not allowed to opt out of drilling activities. They will be compelled to be integrated into a drilling unit. Independent testing of your water is a positive step you can take to protect your property value should something go wrong. Do not let the only water testing on your property be done by the gas industry. NOTE: This article is cross-posted on the Accountability Central website at this link: http://www.accountability-central.com/nc/single-view-default/article/voices-from-the-shale-test-water-before-drilling-to-protect-your-valuable-asset/ Accountability Central is part of the Governance & Accountability Institute, Inc.